Back to back episodes of The Challenge: Battle of the Bloodlines last night, so you all get back to back recaps! Picking up from episode five, Abram's confessional of his hatred for Johnny Bananas is played. He admits that he's never liked him and he doesn't trust him one bit. However, they're on the same team so they have to put their differences aside. Oh, but trust, there is a reason that MTV played this specifically for this episode! The next day, the teams head to the beach for the next challenge called, "Family Connection." The objective is to carry balls from one side of the beach to other...using only their heads. Obviously, that proves to be quite a challenge for the teams. In the end though, the Red Team, once again, kills the Blue Team. It's a girl's elimination day, so both teams have to vote in a girl from the Blue Team. Knowing that she would probably get voted in anyway, KellyAnne volunteers to go into The Pit. The Red Team votes in Nany, including Johnny, which shocks the house since they're supposed to be in cahoots! Since he and Nany have hooked up before, Johnny admits in the confessional that he voted for Nany simply because he didn't want to get in trouble with his girlfriend back home! Of course, Nany is hurt that Johnny betrayed her like this, and out of nowhere! Especially because of something so petty! I have an issue with this because Johnny make a big fuss last season when vets Sarah and Jordan sent him into elimination, and he wasn't expecting it because they were "friends." Now It's crazy that Nany would be the one facing KellyAnne in The Pit, right after Nany and Aneesa vowed to send her in. At the elimination, Nany and KellyAnne play "Ring My Bell." The game consists of running back and forth to swing a mattress to ring a bell fifty times. I would probably keel over...I hate running! 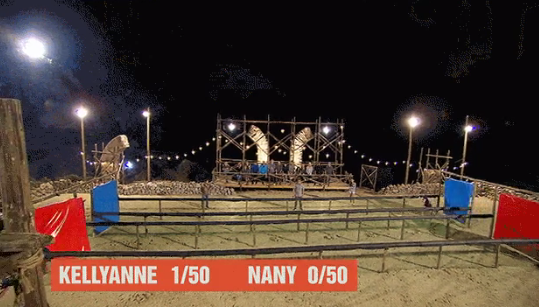 Surprisingly, KellyAnne manages to win, sending Nany and Nicole home! I wouldn't have expected that, but this game is filled with twists and surprises. Like next week, when both CT and Zach, Challenge vets, show up again, wearing gray shirts! I don't think they're joining the cast, and, since Zach was bald, they may be doing something in tribute to Diem Brown. Then again, you never know with this game!